Pancake mix? Check. Frozen berries? Check. Hungry? HECK YEAH. 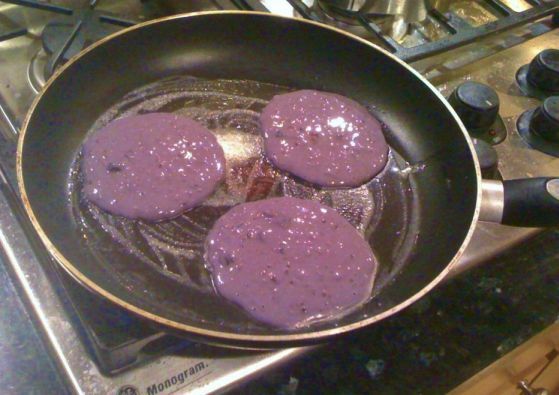 Blueberry pancakes are a thing of the past. Purple pancakes are much more exciting. 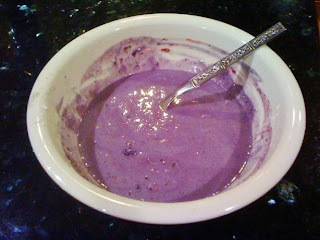 First, you need to micro-zap a handful of berries for a minute in a bowl so they aren't frozen. 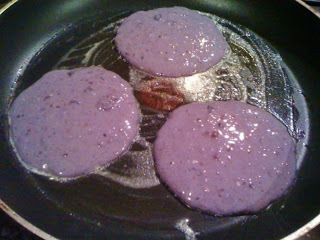 Next, use a fork to mush them up a bit so you don't have just whole berries and liquid, it should be closer to syrup. Mix in a couple of pinches of sugar. 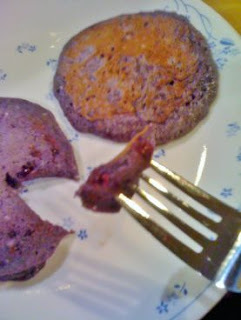 Then mix in water and pancake mix (I used 1/2 cup of mix and 3/8 cup of water, plus an extra half-tablespoon of mix). Use the same ratio as the mix calls for, but assume the berry juice is replacing some of the water. Whip it all up with a fork to make sure everything is mixed together thoroughly. Transfer the mix into a 2-cup measuring cup or small pitcher you can pour from. Melt a little bit of butter in a frying pan on low-to-medium heat and then pour the mix into the pan to create a few individual pancakes. Wait (about half a minute) until the pancakes are bubbling and the edges seem to creep in a bit and you can get a flipper spatula underneath, then flip them over. 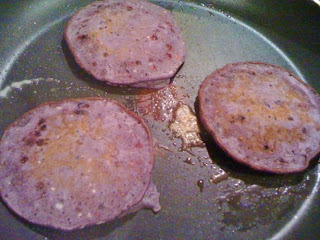 Wait a few seconds for the other side to brown, then flip them onto a plate. They are so tastey you don't even need to add more butter or whipped cream. But you could add whipped cream on top if you really wanted to. Purple pancakes pair well with a glass of non-fat organic milk.